(CNET) Microsoft and the New York Police Department have jointly developed a data aggregation and analysis system that allows officers to tap into live video camera feeds, 911 calls, mapped crime statistics and license plate readers to fight crime. Based on Microsoft technologies, the Domain Awareness System will be available to law enforcement and intelligence agencies around the world, with the city of New York receiving 30 percent of the revenues, New York Mayor Michael Bloomberg and Police Commissioner Raymond Kelly announced Wednesday. 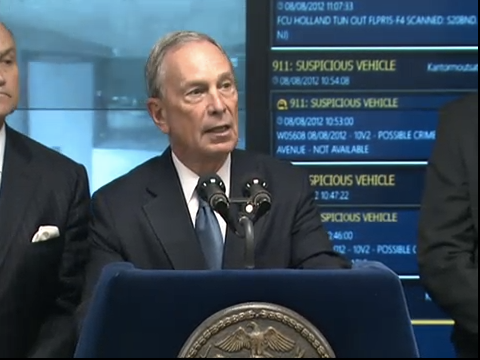 The system can help alert authorities to potential terrorist activities as well as fight everyday crime, Bloomberg said in a press conference at the Lower Manhattan Security Command Center. (Video of the news conference is here.) The center serves as a hub for information from a variety of sources, including network of video cameras that are programmed to sound an alarm if there is an unattended package at the entrance to a building, as well as 600 radiation detectors and more than 100 license plate readers on police cars and at bridges, tunnels and streets. "We're finding new ways to leverage already existing cameras, crime data, and other tools to support the work of our investigators, making it easier for them to determine whether a crime is part of an ongoing pattern," Bloomberg said. For example, the system can alert analysts to the presence of suspicious packages and cars while police search for suspects using smart cameras and license plate readers. The system will be used only to monitor public areas and activities, where no legally protected reasonable expectation of privacy exists," and facial recognition technology is not used, according to the Public Security Privacy Guidelines. (PDF) Video will be retained for 30 days, while metadata, license plate data for five years, and so-called "environmental data" collected by devices designed to detect hazards related to terrorist threats will be held indefinitely. Peter Eckersley, technology projects director at the Electronic Frontier Foundation, told CNET he was worried about the possibility that the system would be abused by officers looking to track down the whereabouts of citizens without having to get a warrant. "It takes a lot of chutzpah for Microsoft and the NYPD to describe location data from license plate readers and surveillance cameras as 'public safety data.' The history of places that we drive our cars is private, and such records would reveal intimate facts about the religion, politics, sexuality, and health of those who drive," Eckersley said in an e-mail. "In the George W. Bush era, Admiral Poindexter promised to build a 'Total Information Awareness' program to wrap America in a layer of ubiquitous high-tech surveillance. But it seems that it took Microsoft and the NYPD to finally bring that vision to life." This article originally appeared on CNET under the headline "Surveillance city? Microsoft, NYPD team on crime fight system."